This is a book about cult movies. What constitutes a cult movie, though? The one that people realized later was a superb movie. Or the one that people are still denouncing? One can’t tell really, given how movies are gauged in our country. Box-office collections still matter the most and Roychoudhury writes of movies when the moolah mattered the most (if anything it matters even more today but we have also “allowed” indie cinema to try and thrive – earlier known as “art house cinema”) , when there was no Netflix; when viewers weren’t aware of the art of cinema, so to say and yet these movies got the status of being “cult movies”. Well, my reading experience of the book was breezy and yes, I also learned a lot about the movies chosen by the author. At the same time, I did not agree with so many films on the author’s list and that is bound to happen with any other reader as well. The book is written in a very tongue-in-cheek style which worked for me. There were places I could not help but chuckle or guffaw, sometimes at the sheer ridiculousness of Indian cinema. And yet there is so much that Amborish has spoken about in this book – about the select movies and also about the ones that aren’t on the list. The sheer amount of research done is staggering. From small things to know to the ones that surprise you instantly. My favourite pieces from the book: Kaagaz Ke Phool, Chashme Buddoor, Silsila, Katha, Chameli Ki Shaadi, Jo Jeeta Wohi Sikandar, No Smoking (a highly underrated movie in my opinion), and the most brilliant piece on The Ramsay Brothers. “In A Cult of Their Own” makes for a perfect monsoon read. It is a light, interesting, and sometimes funny read as well. The kind of book that will not disappoint for sure. This entry was posted in 2018 Reads, Books, Cinema, Film, Indian Film Writing, June 2018 Reads, Non Fiction, Non-Fiction, rupa and co and tagged 2018 Reads, Amborish Roychoudhury, Cult Cinema, Film, In A Cult of Their Own, Indian Cinema, June 2018, June 2018 Reads, Non-fiction, Non-Fiction Reads, rupa books on June 20, 2018 by thehungryreader. 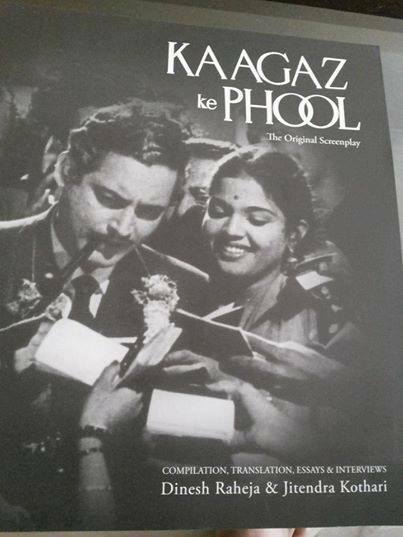 “Kaagaz Ke Phool” is one of my favourite Hindi films. I absolutely love the movie. Everything about it and this is before I had heard how it flopped, before there were any preconceived notions formed in my head. There is something about this movie, not to forget so many memories attached to this one because of my father, who had this immense love for old Hindi movies. I have got it from him, so when my favourite movie was converted to an original screenplay, I could not wait to read it. “Kaagaz Ke Phool: The Original Screenplay” is yet another screenplay by Dinesh Raheja and Jitendra Kothari. It is not just another screenplay though. It is magical, given how the movie is. There is the director’s downfall, played superbly by Guru Dutt, almost depicting his life. There is the heroine he loves, played by Waheeda Rehman, subtly to the hit. He is married. His career is going nowhere. He is soon forgotten by the world. That in short is the plot of the movie. The screenplay comes alive in two languages – Hindi and English. The essay on Guru Dutt’s troubled relationship with Fame and Success is what stands apart in the entire book. It is beautifully written, honest and yet heartbreaking. The interviews are again the icing to the plot – with Waheeda Rehman, VK Murthy (the camera assistant), and Devi Dutt (Guru Dutt’s younger brother) manage to bring out the man, the director and the creative genius that was Guru Dutt. The tragedy of his life, is so reflective in the book – through the essay, the interviews and the emotion with which these two writers have penned this book. “Kaagaz Ke Phool: The Original Screenplay” in more than one way is a dedication to the director, the actor, and the story of the movie. It is timeless, but of course, but Raheja and Kothari might as well have done the younger generation a huge favor by publishing this book and bringing this classic to life. This entry was posted in Books, Film, Om Books, Review and tagged Dinesh Raheja, Films, Guru Dutt, Hindi Movies, Jitendra Kothari, Kaagaz Ke Phool, movies, Om Books, Waheeda Rehman on August 10, 2014 by thehungryreader. There is perhaps only one Bollywood lyricist I adore and that has to be Gulzar. Not only as a lyricist but also as a poet, a director, a writer and everything rolled into one. 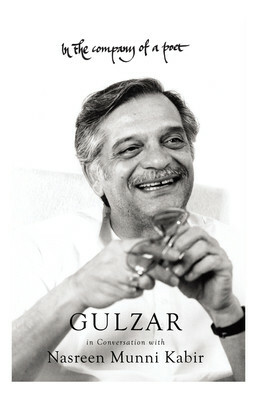 There is something about what Gulzar Sahib does, that makes it all alright. Everything is relatable to life and what it has to give or take. Just about everything. So when there is nothing that he writes or anything that is written on him or with him, one just cannot resist but read it. Nasreen Munni Kabir has done Gulzar fans a huge favour by collaborating with him and producing a book of her conversations with him. “In the Company of a Poet” is all about Gulzar – the man, the child of his parents, the brother, the father, the grandfather and the poet. It is everything that you wanted to know about the genius (I am taking the liberty to call him that, because to me he is exactly that), and nothing better than intimate conversations, through Skype and through meetings. Nasreen Munni Kabir has given us a treat in the form of these conversations. I started reading the book on a rainy day and it was perhaps the only time for it. It took me a long time to finish it because I was in-between reads, however when I went back to it, I could not stop reading it. “In the Company of a Poet” is enthralling in the sense that it gives perspective after perspective and one doesn’t tire of them as a reader – Gulzar Saab’s view of things, people, the film industry, poetry and the world is just superlative. There is a sense of humour in what he says. There is nostalgia (even on this aspect, he has a wonderful way of looking at it). There is a sense of how things were and how they are. At the same time, he also is of the belief that one must learn the new and embrace it – as in his case, he learnt how to use Skype. Gulzar Saab’s love for poetry is so evident, that one just wants to read more of it – his and other poets’ works as well. He speaks of how he got into movies, his experiences with Hrishikesh Mukherjee, Bimal Roy and R.D. Burman and many more legends. He talks of how he has to play tennis every morning without fail and about his relationship with his daughter and grandson. For me reading this book, was not just knowing about Gulzarji but also about the people connected to him and that felt just too good. He speaks of partition and his nightmares and that brought tears to my eyes. There are a lot of poems as well in the book, which only lend another voice. “In the Company of a Poet” is an insightful read. Nasreen Munni Kabir’s questions and observations are well-thought of and planned. Her research is meticulous and she gives more than enough room to the poet and writer to speak and talk about his experiences. She is intuitive and has chalked down every bit of the conversation to detail. For every lover of Gulzar and his works, this is a must read. This entry was posted in Books, Film, Poetry, Rainlight, Review, rupa and co and tagged Bollywood, Films, Gulzar, In the company of a Poet, music, Nasreen Munni Kabir, partition, Poetry, rainlight, rupa books on July 13, 2014 by thehungryreader. Why must one write screenplays? Why must make a book of it? I have always wondered about this. A lot of screenplays as being published as books, with additional material, such as interviews and such. Till recently, I did not see the significance of this. I remember reading the screenplay which the author, Dinesh Raheja had written earlier – that of Sahib, Bibi aur Ghulam and having loved it, but still my questions remained unanswered. But I guess, I got my answers after reading Dinesh Raheja and Jitendra Kothari’s new book (again an original screenplay), “Chaudhvin Ka Chand”. I think it is mainly because of what it depicts, what it is, the dialogues, the larger context of the movie and the fan’s relation to it – from start to finish. If I had to pick one of Guru Dutt’s finer works as an actor, I think after Pyaasa and Sahib, Bibi aur Ghulam, I would pick this one. There was definitely a lot which has been underrated in the entire movie. The movie is a Muslim social drama and it is a love-triangle at that. It is a comment on male friendship (bromance in today’s parlance). It is also a tribute in so many ways to a time gone by (the book I mean), given the movie released in 1960. The setting of the movie is Lucknow, so one can only imagine the dialogues written by Saghir Usmani would shine on screen, and they do. The story is of Aslam (Guru Dutt) and Pyare Mohan (Rehman) – friends who have fallen for the same woman, Jameela (Waheeda Rehman) unknowingly and sacrifice and guilt is the crux of the movie. The original screenplay written by Dinesh Raheja and Jitendra Kothari must have only been painstaking given the Urdu in all those dialogues, and yet the screenplay is a delight to read. The interviews (yes there are few) only enhance the script. Raheja and Kothari capture the essence of Guru Dutt and his work. Though this movie was not directed by Dutt, you can see traces of him and that is what they speak about. The commentary and extended analysis are a treat in this book to watch out for. And of course do not forget, that once you are done reading it, you would only want to go and watch the movie and live the magic of this wonderful film and all its grace and sensitivity. 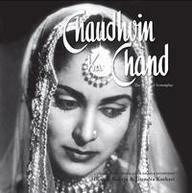 This entry was posted in Books, Film, Om Books, Review and tagged Chaudhvin ka Chand, Dinesh Raheja, Film, Guru Dutt, Jitendra Kothari, Om Books, Rahman, Waheeda Rehman on March 19, 2014 by thehungryreader. There is no better way to get to know a film-maker than through his works. To watch them repeatedly – one after the other, till they charm you, make you smile, make you cry and make you think. That to me is the best way to know a filmmaker. To realize and understand what made him or her make movies like the ones you are watching, what is the psyche behind them, and what is the connect it has with you and the impression it leaves behind. One such filmmaker whose works I have admired for years now has to be Guru Dutt. His cinema according to me was way ahead of its time. The depiction of a poet trying to come to terms with the world’s ways or the idea of a disillusioned filmmaker trying to cope with failure, Guru Dutt to me was a storyteller beyond words. He to me was successfully in creating poetry on screen – with eye movements, with body language and with silence. So when I got the opportunity to read, “Guru Dutt – A Tragedy in Three Acts” by Arun Khopkar, I jumped at it. Arun Khopkar is an award-winning film director and scholar and it is through his eyes that the reader gets a sense of Guru Dutt and three of his films – Pyaasa, Kaagaz Ke Phool and Sahib Biwi Aur Ghulam. Arun Khopkar does not talk about Dutt’s private life even once in the book and that is commendable. He looks at the person and the director through his movies which is most essential. The technical aspects of Guru Dutt’s movies are explored more – with reference to lighting, the play of shadows, the script, the music, the plot of his movies and ultimately to me, “the man who never tried to fit in”. Khopkar’s language is simple and retrospective, which has been beautifully translated from Marathi by Shanta Gokhale. The idea of a troubled genius is clearly communicated throughout the book, and what I found most intriguing was how Khopkar has managed to understand Dutt layer by layer purely through his cinema and silences. For me, each film mentioned in the book is precious. Khopkar’s views on each of these three films are unique and intelligent. His writing does not ignore the minor or secondary characters. He takes into account every aspect of those films and presents Guru Dutt to the reader – raw and brilliant. The book is not a long read and as the writer describes in the preface, that it was just meant to be a personal documentation on the legendary filmmaker and nothing more. It somehow took the shape of a book and I am glad it did. 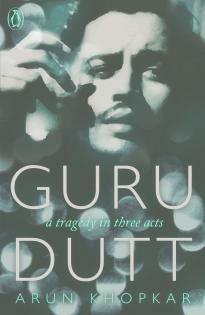 “Guru Dutt: A Tragedy in Three Acts” is a book that will make you think about art and the genius that Dutt was to devote his life to art and sometimes the madness that came with the devotion. A short and effective read, this is one book on cinema which you shouldn’t miss. This entry was posted in biography, Books, Film, Non Fiction, Penguin Books, penguin india, Review and tagged Arun Khopkar, biography, Film, Guru Dutt, Guru Dutt A Tragedy in Three Acts, penguin india, Shanta Gokhale, translation on November 22, 2012 by thehungryreader.